While I was in the U.S. last month, I stumbled upon a segment on the Food Network about a New York patisserie called Lady M Confections. I didn't have time to go there when I was in New York unfortunately, but I sure will make the effort next time! Apparently, their signature cake, the Lady M Mille Crepes (trademarked even), is a stack of crêpes alternating with a custard filling, finished off with burnt sugar. I haven't tried this yet but I've been making savory stacked crêpes for years, since I read a recipe somewhat like this one in some magazine. Crêpes are the perfect bland, buttery vehicle for a creamy filling. The standard one I make is the one pictured here - the filling is a cream cheese / crême fraiche / base (like a good old '70s dip) with a lot of possible variations. Chilled and cut into very small segments (it's very rich, so be careful! ), it's a great party snack or appetizer. It looks very pretty, as you can see. The key to making this all look pretty is to make the crêpes fairly uniform in size. I always make my crêpes in the same 8" / 25cm nonstick frying pan, since I don't really make them often enough to justify having a specialized crêpe pan. And that circumference is just about right. For the Crêpes: This makes about 15-20 crêpes, depending on how many you mess up! You can still use ones with a small tear in them. To clarify the butter, melt it in a small saucepan or in the microwave, let sit a minute or so until the solid white stuff floats to the top, and scoop off. The golden liquid you're left with is clarified butter. To cook the crêpes, heat up a nonstick frying pan or crêpe pan (see above) over medium heat. Thinly coat the bottom of the pan with oil or clarified butter (additional from the amount put into the batter). Spread about 1 tablespoon of batter rapidly over the bottom of the pan. Cook until the edges curl up, then flip over and cook for another minute. As anyone who has made crêpes knows, the first one always turns out terrible looking, but after that they shape up. Cool the crêpes before proceeding. Note that the filling is basically a cream-cheese dip. You can vary the ingredients quite a bit: instead of bacon or proscuitto, try smoked salmon, or other types of ham. It's also fine just with the oniony base. Since cream cheese is sold here in different units (200g) from the U.S. (8 ounces per Philadelphia Cream Cheese pack), I've given the ingredients as proportions which you can scale up or down. Mix all the ingredients together, by hand or in a food processor. When it's done it should be soft and spreadable. Put a crêpe on a flat plate, and spread with some of the filling. Repeat until you end up with a stack of crêpe-filling-crêpe about 15-20 high. 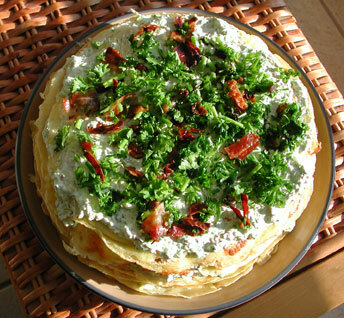 Finish with a thin layer of filling, and decorate the top with chopped parsley, etc. Chill in the refrigerator for several hours to let the filling set and also for the crêpes to sort of amalgamate itself a bit with the filling. This makes it a perfect day-ahead item for a party. Cut into very small wedges or tiny squares with toothpicks for a party snack. To serve as an appetizer, serve a small wedge (each 'cake' can be cut into 12-16 pieces) with a small lightly dressed salad of arugula or watercress. Submitted by maki on 2005-12-08 02:47. The Lady M Mille Crepes sounds like a custard and crepe rather than ganache and cake version of the Hungarian Dobos Torte, right down to the sugar topping. I'll try this recipe soon Maki! it sounds nice and looks nice too. Boy, is that making me hungry. It's been years since I made creapes, but this may have me digging out the old crepe pan. There really is nothing quite like a crepe, fresh from the pan, with a little jam or sugar and cinnamon. Great use of that first, wonky looking one, assuming you can stop at one. Thanks for reminding me how good they are. if not for u this website would be lacking a lot. thanks for all your hard work and dedication! Do noy make me this hungry before lunch! This looks delicious. I loooooooove crepes! I like your meaty version, though. i never made crepes, but these look delicious! I've been following your site for a while now. I live in the U.S., but I come from French Canada. This dish seems interesting, but I just can't help but think "you're doing it wrong!". Ha! I know, it's silly. I grew up with these as a staple in my house, and we alawys served crepes either plain with maple syrup, or filled with cheese, ham, or fruits/ veggies. I guesse I just realised how native asians feel when people in the U.S. and other western countries try making our own versions of traditional recipies! On a side note, your recipies have helped me navigate asian groceries a lot. Thank you! It's pretty hard to find the right ingredients when you can't read the labels!